With Visual Studio Community 2015 you get a full Visual Studio version for free! In following post you can learn how to download it and – for SharePoint – how to install the Office Developer Tools. I am just as excited as other bloggers like Tobias Zimmergren about Microsoft’s new strategy Mobile First, Cloud First that seems to lead to a new Microsoft corporation that invents itself in surprisingly fast steps. In November 2014 Microsoft made another great step in its opening process. As S. Somasegar wrote they were Opening up Visual Studio and .NET to Every Developer, Any Application. That is they open up Visual Studio development to a broader community. And they release free versions and offer more Open Source projects then ever. For SharePoint development you need an additional tool – the Office Developer Tools. There is one for Visual Studio 2013 and one for Visual Studio 2015. Both versions launch a Web Platform Installer pointing to the entry for the Office Developer Tools. Back in 2013 the Visual Studio Community 2013 version replaced the free Expression version of Visual Studio. 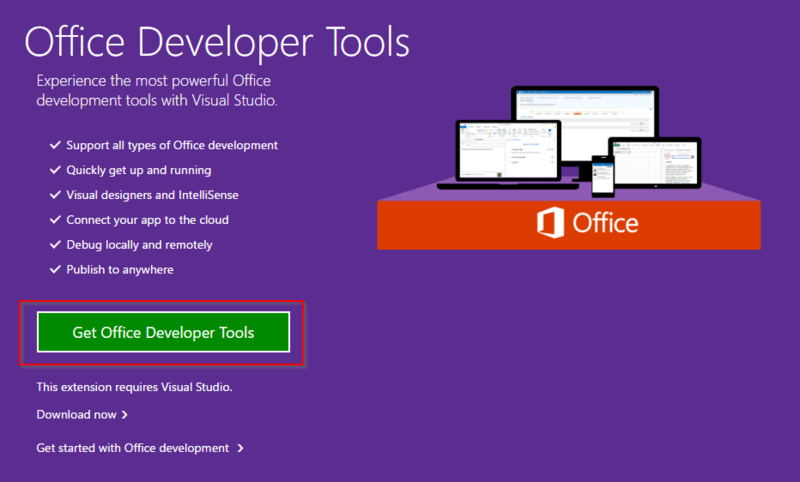 Additionally you needed the Office Developer Tools for Visual Studio 2013. This link starts a download of the file OfficeToolsForVS2013Update1.exe. If you don’t thrust a download from the URL aka.ms (which is indeed a Microsoft URL) you can have a look at this Microsoft Announcement, the link Download the Office Developer Tools for Visual Studio 2013 – March 2014 Update points to the same file. On this StackExchange page you can find further information. With Visual Studio Community 2015 the tools were renamed from “Office Developer Tools for Visual Studio 2013” to “Office Developer Tools”. As a user wrote on this SharePoint Community page you can download the Office Developer Tools here. Click on the button Get Office Developer Tools. There is already an Update 1 available that includes a vocabulary change. In 2015, the SharePoint “app model” name was changed to the “add-in model.”. Presumably, this change in name was necessary to introduce the SharePoint Mobile App. Meanwhile there is an Update 2 available as well. The “Get Office Developer Tools” link already points to these updates. As you can see in the comment from user Sean Laberee about Update 1 the link is correct even though it downloads OfficeToolsForVS2015.exe which is the same as what you used in August (first release) and November (Update 1). It also launches the Web Platform Installer pointing to the entry for the latest update of the Office Developer Tools. Boy am I glad I chose to work with Microsoft technologies back in the day when I had to choose the direction for my professional career.